Written and edited by the leading authorities in the field, the revised 6th edition of this authoritative reference provides the most up to date and complete guidance on infectious diseases of the fetus and newborn. Together they provide definitive coverage of microbiology, pathogenesis, diagnosis, treatment, prevention, and prognosis of infections acquired in utero, during delivery, and in the early months of life in both premature and term infants. Provides guidance on infections found in both developed and developing worlds. Offers information on breastfeeding and infection transmission. Discusses maternal infections when they are pertinent to the infant or developing fetus. Features a consistent format and chapter organization that makes reference quick and easy. 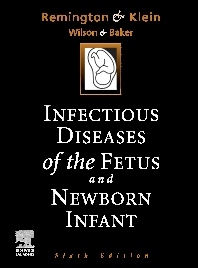 Includes coverage of infections found in utero, during delivery, and in the neonatal period.